Eleven-year-old Tiffany Aching wants to be a real witch. But a real witch doesn't casually step out of her body, leaving it empty. Tiffany does - and there's something just waiting for a handy body to take over. Something ancient and horrible, which can't die. Now Tiffany's got to learn to be a real witch really quickly, with the help of arch-witch Mistress Weatherwax and the truly amazing Miss Level. 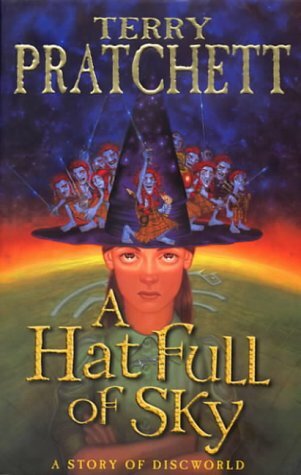 Wise, witty and wonderfully inventive, A Hat Full of Sky is Terry Pratchett's second novel about Tiffany Aching and the Wee Free Men. His first novel for younger readers set in the Discworld, The Amazing Maurice and his Educated Rodents, won the Carnegie Medal.